This is Part II of the Roku XDS review. Part I covered the functionality, operation and cost involved with the Roku box. In this continuation we examine content available on the Roku. Our review will cover some of the more sought after and popular channels while touching on some of the specialized content that Roku offers. We will not be discussing every channel or content provider. We also will not be analyzing content provider agreements or content rights. Keep in mind, this is a review of content channels available via the Roku box. For the Roku box review please read Part I. This is not a support forum nor a help center, for information or assistance on your Roku box we direct you to the Roku forums. Let’s start with some basics. The Roku Newscaster channel has a variety of options for catching up on current events. All network television news broadcasts are available including specialty news programs such as 60 minutes, Hardball, Nightline and others. Included in the Newscaster channel are sports broadcasts from ESPN with Mike and Mike, Pardon the Interuption and Around the Horn among others. Additionally, BBC, Current TV, CSpan, PBS and other specialized channels are included via Roku Newscaster. While news gets you up to date, most viewers are looking for entertainment. That is where the Roku really hits the mark. There is an enormous channel lineup for interests of all kinds, from movies and TV to netcasts, music and games. One of the most popular channels is Netflix. If you are at all familiar with Netflix then you understand the benefit of a Netflix subscription. Netflix on the Roku is incredibly simple, which is a good thing. Netflix has basic genre categories to choose from and recommends additional suggestions based on your viewing patterns. There is a search area and instant queue for finding and saving shows of interest. The stream from the Netflix channel is fantastic. It is extremely rare to have any kind of interruption while viewing a program. The content selection is extensive and updates frequently with new movie releases and television shows. The Netflix channel itself is one the easiest to navigate with box cover images, title names, 5 star ranking system data and short blurbs describing each title. While Netflix has an overwhelming amount of content, there are some areas for improvement. Netflix needs to add more new and current releases for streaming to the Roku box. At this time, many of the more recent movie releases are DVD only which in many ways defeats the purpose of viewing them through the Roku. As with any content delivery issues, via streaming media, the responsibility falls on Netflix and to a greater extent the content rights owners to allow their media to stream. With that said, streaming content appears to be improving with expanded content and more frequent updates. For movies, the choice is clearly Netflix. For television programs, Netflix offers old seasons but not current season episodes. That is where Hulu Plus comes in. Hulu Plus has current season episodes available and week by week programs so that you can stay current with your favorite shows. Hulu Plus also offers a variety of movies but for the most part viewers will access Hulu Plus for television programs. The Hulu Plus interface is attractive and easy on the eyes, there are a lot of different ways of finding programs and they have a ranking system similar to Netflix. The picture quality is good and without the jagged blips you may experience on a computer monitor. By and large, the Hulu Plus channel has the potential to be outstanding. Potential is one thing, success is another. The channel is way too complicated for the average TV viewer. The interface needs to be simplified. The absolute biggest disappointment with Hulu Plus is the content availability. Hulu Plus is a pay service and is intended to provide more content for the subscription. While they do offer more content, the content is limited as to where it’s viewable. 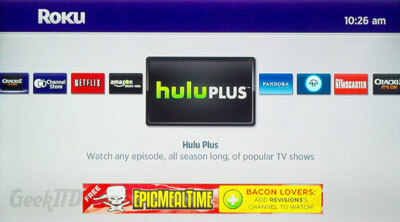 Many current television shows are now what Hulu Plus calls ‘web only’ which means you have to view them via your computer, thus defeating the purpose of the Hulu Plus channel on any device. Unfortunately, that trend has continued to increase as more shows move to ‘web only’ status. It is a huge problem that Hulu Plus needs to address. As it is now, we cannot recommend Hulu Plus as an acceptable alternative to broadcast television. Lastly, Hulu Plus continues to display ads during shows, which is exactly the same as traditional Hulu (free version) online. While we won’t debate the purpose of ads or Hulu Plus’ revenue streams, we will acknowledge the lag time during programs because of them. Additionally, video tends to freeze or become out of sync with the audio when the ads are accessed. It’s impossible to say with certainty that the ad placements cause the viewing problems, but generally speaking the video is fine until the ads are accessed. Overall, we are disappointed with the Hulu Plus channel. It shows great promise but poor execution. It is obvious Hulu Plus has other priorities than to deliver the content they hold so dear. When they realign their priorities we expect a well developed and content filled channel which will be well worth the subscription fee. Sports are one of the most sought after items on any viewing device, whether its the Roku box, cable TV, satellite or other media streaming device. The thing to remember is that sports are a business and as such it is their job to make money not necessarily bring you the games you want to see. Having said that, major sports are realizing the potential and benefit to streaming games. 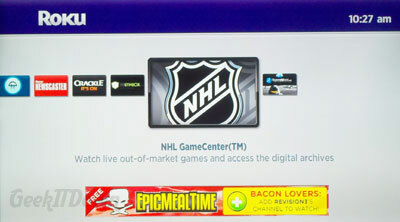 The NHL, NBA & MLB all have Roku channels. You still pay the subscription fee for their respective sports packages but now you can watch them via the Roku on your big screen flat panel television instead of a smaller computer monitor. The UFC also has a Roku channel which adds another option to the sports lineup. While none of these are perfect, you do get the same amount of games advertised by those sporting organizations (blackouts will still apply). Sporting events are a tough nut to crack when it comes to having full and complete access, but progress is certainly being made. If you want more game options then let the sporting organizations know it. As for the other major sport, the NFL, they aren’t viewable on any media other than network television because that’s how they want it. Roku nor anyone else can ‘flip a switch’ to change that. However if you feel the NFL needs to have their content available on sources other than network television then you need to contact the NFL as they are the only ones who can change it. Many viewers these days are interested in more than just movies and television. Podcasts or Netcasts are a great alternative to traditional television. Often listened to, more and more these specialty shows are adding video. Probably the most popular is the TWiT Network. Leo Laporte, one of the most respected names in tech journalism has created a haven for tech enthusiasts, geeks, nerds and those who are simply curious about technology. The TWiT channel has many of the popular netcasts in video form that listeners have grown to love, such as This Week in Tech (TWiT), This Week in Google (TWiG), Windows Weekly with Paul Thurott and many others. The channel is simple to navigate and we’ve noticed very few problems with streaming. 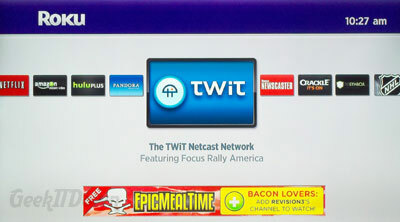 In addition to the TWiT network, CNET has their own channel which adds more technology access via the Roku box. Shows like Tekzilla, Buzz Report and Buzz Out Loud lead the lineup. Amazon On-Demand Video – Pay per view movies and television shows. Crackle – Instant streaming free movies. NASA – The NASA feed, including launch coverage. Many games including Mah jongg, Video Poker and others. Several exercise channels which focus on a routine, not a program. There are even channels that can be added manually like HGTV and Food Network. More new channels are added frequently. 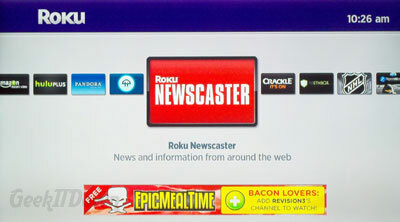 The Roku website provides a complete channel store lineup at http://www.roku.com/roku-channel-store. There are many other channels that are not listed in the channel store and the lists update often. The XDS (model used in this review) is currently available at the Roku website, at BJ’s and at Amazon.com. Since writing this review Roku has updated their models to the Roku 2. 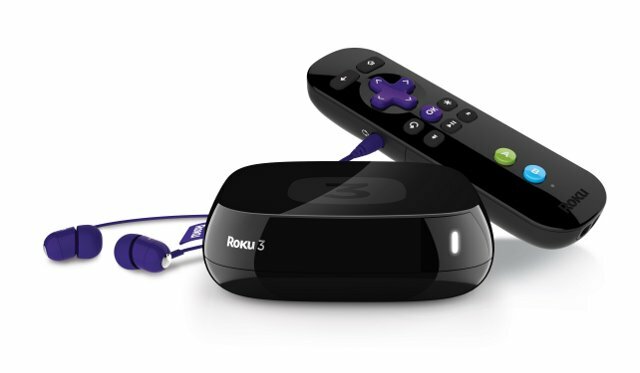 The XDS we reviewed is comparable to the new Roku XS version shown below. Are there any channels you prefer over others? Any experiences you’d like to share? Have questions on Roku content that we didn’t answer? Let us know with your comments! @alfagirl56 – Not sure you need a Y cable in this scenario. Your cable (satellite) already feeds in presumably via coax or HDMI to your TV. Since the Roku doesn’t use coax, just use one of the Roku connection methods to connect to your TV. Again, presumably you have a TV that supports multiple input methods, so just change the input when you want to watch one or the other. My question is, can I install “y” cables in order to keep my VERY basic satellite service for real-time network access, and utilize the ROKU as well? My thought is to hook both into my TV, then access ROKU when I need it, or turn on the satellite receiver when I need that? I’m also considering just going back to my antennae for network. Do such combinations of services work? I find it a little bit of a pain to not have live and local news, weather and PBS. @Russell – I haven’t looked at ESPN in some time, but Around the Horn used to be available. Content owners continue to re-manipulate their shows and sources in order to put content behind paywalls, so it isn’t surprising if ESPN somehow restructured it. One of the major reasons I purchased a Roku was for Espn. Unfortunately, my favorite shows, First Take, Around the Horn, and regular Espn don’t show. @Jessica – Thrilled you found the info useful! Be sure and let us know how you make out. I am looking to cut the cord with cable, they’ve been nickeling and diming me for too long. Right now I pay $36 a month for 11 channels, 4 of which are local government or the local cable company’s ad page that flips through all day long. I only watch 3 channels total, which for someone of my financial status, doesn’t make sense. Thank you for outlining and reviewing this; I’ve heard some good things about it but was still confused about how it worked and what it did exactly. I’m going to try hulu plus for 30 days for free with this little device… will see how it goes. Thanks again! @oldestgenxer – I won’t sugar coat it, those “hard to please” people have a heavy learning curve when it comes to replacing cable in any fashion so be prepared. I definitely recommend trying the Hulu Plus free trial when you get the Roku if watching current content is important to you. Be sure to let us know your experience. I’m going to get one and try it for 30 days and see if I like it. I’m just looking to cut the cable bill down. Right now we get our internet and cable from the cable company, and it’s about 120 per month. If I cut down to basic cable, even if I have to pay for some channels I should come out ahead. I could come out ahead enough to pay for increased internet speed. That’s the plan. I’ll let you know how it goes. BTW-we have a few hard to please people in the house. My mother in law needs her old tv shows and movies, and Matlock, and the Food channel. Plus she’s completely un-tech savvy. If we can train her to use it, this would be a victory for old people every where. @martingale – Glad the information was useful to you. Thanks for commenting! Useful information. Fortunate me I found your website by accident, and I’m stunned why this coincidence didn’t came about earlier! I bookmarked it. Thank you for another informative blog. The place else may just I am getting that kind of info written in such a perfect way? I’ve a venture that I’m simply now working on, and I have been at the glance out for such info. Thank you for any other fantastic post. Where else may anyone get that kind of info in such a perfect manner of writing? I’ve a presentation next week, and I am on the search for such information. @Booklady – Hulu Plus is not required, neither is Netflix. However, if you want to watch shows from either service then you’ll have to subscribe to their respective services. But the Roku itself does not require you to use any specific channels (Netflix, Hulu Plus, etc. ), you choose only what you want. Hope that answers your question, thanks for commenting! Is Hulu Plus required? Do Roku users have to subscribe to Hulu Plus? Do they also have to subscribe to Netflix? @Seth – Thanks for the comments! While Roku designates channels, they are really service feeds. So when you say “no network channels, local channels” that’s not quite accurate. True you cannot see local news (however that is slowly changing), but all networks are supplied through services, ie Hulu Plus and others. Unfortunately, Hulu Plus is at the mercy of the networks to decide if they want to allow their shows to be broadcast through their service or line their pockets by restricting to cable providers only. 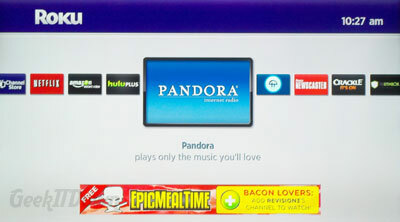 The Roku box has no say in that at all, but it’s easy to get confused. Netflix. Streaming is the way of the future, some titles will not be available immediately, again due to movie studios and property rights, but expect Netflix to move more and more to streaming in the future. Again, Roku has no say in what content Netflix is allowed to provide. “NOT LIVE FEEDS” is a bit confusing. All sports packages provide live sporting events, for example NHL shows live games with a 5-10 second delay which is typical of online streaming. Broadcast news is fed through the Newscaster channel which is free. Yes the content is delayed, but NBC Nightly News for example is available the same evening without commercials. Finally, channels cost nothing, except for the few games or rare special interest item. Mainstream channels are free, you pay for their service. As an example, Hulu Plus is $7.99/month and you can watch any show NBC, CBS, ABC, FOX and any other channel allow them to broadcast (which is quite a lot). HBOGo is the same way. HBO will never give anything away for free so you’ll need to pay for their service to watch it on Roku, but the channel itself is free. If you are looking to “replace” your cable tv, dish or direct tv with a box like the Roku you WILL be disappointed. These boxes have a loooong way to go before they can even compete in that circle. 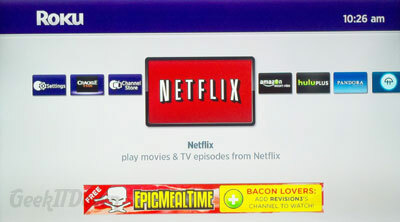 However, if you’re just looking for a streaming alternative from your Computer then these boxes are great for that. I keep hearing people talking about these boxes as a viable “alternative” to cable tv, etc. Frankly that’s nonsense. You get no network channels, local channels. And you’ll get nickled and dimed for the content you desire to have on these boxes. As for Netflix, you will NOT get most of the recent movies that they will have available for streaming. Most of those can only come through the mail, for now. So say you want to watch Captain America, which is available on HBO but will NOT be available on Netflix Stream. Netflix will provide a HANDFULL of recent movies and most in that hand are not the blockbusters you are sure to want to watch. So keep that in mind. Also most of the stuff on these boxes are NOT LIVE FEEDS. They’re pre-recorded snippets of News, Sports, etc., unless you purchase the specific channel. But of course if you pay for all these channels your bill may be just as much as your cable bill. The nice thing is, these boxes are not so expensive that you can’t give it a try. So don’t say nobody ever warned you ahead of time if you do make the purchase. My advice, don’t chuck your cable tv, dish or direct tv too soon for these boxes, you might be sorry. @Kevin – Your comments would seem to echo others across the web. With the current interface, limited or restricted content, ads on the Plus service and very few benefits of Plus vs standard Hulu, it’s no surprise they’re for sale. This is slightly off topic, but the web browser (PC) interface for Hulu-Plus is a joke and really the only feature keeping me from becoming a subscriber. Ironically Hulu provides a nice feature-rich search function for their free content, but not for their paid content. It makes no sense. Anyway, like I said, off topic. But I wanted to get that out there since many of us using our PC’s for streaming movies. Thanks for the comments Jayde! It can be daunting comparing multiple devices for sure. While we haven’t reviewed the Apple TV, maybe we can point you in the right direction for making an informed decision. First and foremost, look at the content that each provides. Does one or the other offer more of the content you like to watch? Then, look at the cost of that content by device. It might be you save money by investing in one over the other. Finally, try not to get caught up on the hardware of the two. Each aim to do the same thing, bring content to you. In the end, unless you’re looking for something in particular the hardware will be sufficient. I am looking into purchasing this devise and I am torn between this an apple tv, I wish someone could compare the two and give me an honest opinion. Thanks foe the review of this product I think it sounds promising.